I like duck gizzard, and I also like chicken gizzard. Actually, when I was little, I didn’t eat any animal gut, mainly because I didn’t dare to. But there was one time, my neighbors had a BBQ party. They also gave us some skewers. One of them was chicken heart. I thought I just gave it one bite and see what it tastes like. After that bite, I fell in love with chicken heart immediately. Then later, I dared to eat gizzard, which is also yummy to me. This dish is a quick stir-fry. And it’s a combination of duck gizzard and spicy flavor. 1. 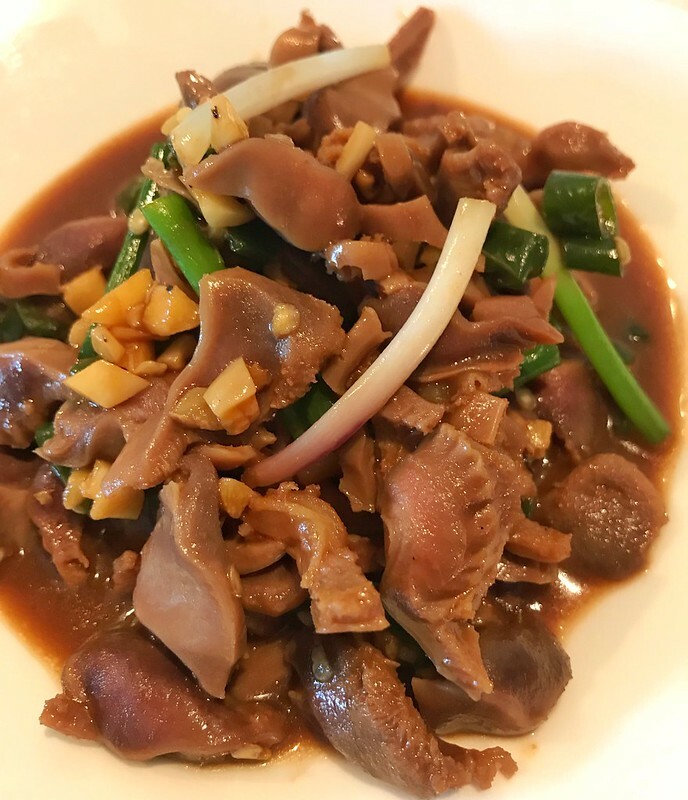 Cut duck gizzard into slices. For about 1 cm. 2. Chops 2 cloves of garlic, 1 stalk spring onion, 2 green chili and a little ginger. 3. Prepare the sauce: 1 tablespoon cooking wine, 1 tsp light soy sauce, 1/2 tsp dark soy sauce, 1 tsp sugar, 1 tsp corn starch and 1/2 tsp salt. Mix them well in a bowl. 4. Heat a pan. Add in 2 tsp oil. Sauté ginger and garlic till aromatic. 5. Add duck gizzard in. Quickly stir fry with high heat for about 2-3 mins. They will turn white in color. 6. Add in green chili, stir fry till chili flavor is out. 7. Pour in the sauce. Let gizzard mix with sauce evenly. And reduce the sauce a bit. 8. Finally, sprinkle spring onion. Stir fry a bit. And ready to serve.